At 0925 Peter, July 22, 1943 while flying at an altitude of 8700 feet on a true heading of 0810 the bombardier, Ensign Rosser, reported a wake at one o'clock (about 10 degrees relative bearing) distant one and a half miles. At this time we had just emerged from between two strats of clouds, heavy cumulous below us from about 5500 to 8000 feet and also stratus above us with bottoms at 9000 feet. Visibility below the clouds was limited to about 5 miles by a surface haze. We immediately made a right turn to bring sighted object within the view of the pilot in the left side of the cockpit and opened the bomb bay doors. As the plane began to turn the bombardier reported that the wake was a submarine and we pushed over in a steep glide. 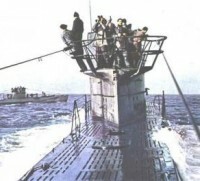 The submarine quickly came into view and appeared to be a German U boat of the 740 ton class fully surfaced on a southeasterly course at a speed of 8 to 10 knots. We continued the turn back into the cumulous clouds where we reversed our heading immediately, emerging this time at an altitude of 3500 feet at an airspeed of 230 miles per hour and passed over the submarine on a northwesterly heading. The submarine apparently sighted us for the first time at this point and began a crash dive. We executed a wing over and attacked from his starboard quarter with a target angle of 150. A stick of six MK 66 depth bombs fused to explode at a depth of 25 feet was dropped from an altitude of 150 feet with an intervalometer setting of 80 feet spacing at 200 knots. The air speed at the time of drop was 200 miles per hour (about 205 knots). About 15 feet of the stern of the U boat was visible when the plane passed over its track line. No stop watch was used but the Navigator counted the time as follows: 1001, 1002, etc to 1007 from the time of submergence of the conning tower until the plane passed over the track line. We crossed the track line about 100 to 150 feet forward of the swirl. After the drop was completed the plane was maneuvered to make another run from the port beam. We hoped that our first attack had been successful and anticipated that the sub might resurface immediately, in which case it was intended to attack again using the three remaining bombs. However, the only visible evidence was the swirl, the disturbed area of water resulting from the explosion and two smoke lights. These smoke lights had been taped to the tails of the first and last bombs in the stick. It is believed that they broke loose in the slip stream and marked fairly accurately the point of entry of those two bombs. They were both contained in the area of disturbed water, the first just in the starboard edge and the other 50 to 100 feet from the port edge (port and starboard of the sub.) The disturbed area of water was nearly tangent to the forward edge of the swirl extended into it a few feet. It is believed that the explosions straddled the submarine forward of the conning tower. The dive of the submarine was rapid and steep, probably the steepest safe dive possible. It is believed that the bombs may have exploded over his forecastle which might explain the absence of conclusive evidence of damage. There were slight oil streaks in the disturbed water but they very probably were part of the bomb residue. To establish timing I'll recapitulate. The sub was sighted at 0925. An S turn was made toward him, away along his course line and back over him into the sun, losing altitude. This maneuver required 1-1/2 to 2 minutes at the end of which were over the sub at about 3500 feet. Also at approximately this time the sub sighted the plane and began his dive. About 85 to 90 seconds later the plane had completed a wing over and dropped and was again passing over the sub. Subsequent to the attack we remained at the scene for approximately 20 minutes. We hoped to see further evidence of damage and thought it probable that the submarine would be again forced to surface very close to the point of submergence. After 20 minutes we abandoned hope of sighting wreckage and began flying a hold-down square ten miles on a side with its center at the attack. 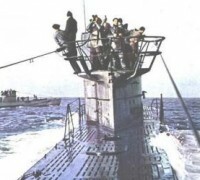 At no time was the plane in such a position that fire could be opened on the surfaced submarine without disclosing our presence and thus make it possible for the sub to escape. Consequently no guns were fired either by our plane or by the submarine.